Ships from and sold by IncrediBody. 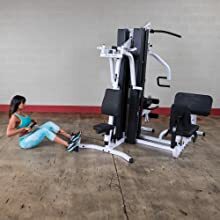 This multi-station workhorse provides health club quality strength training for up to three people simultaneously (with optional VKR30 Vertical Knee Raise Attachment). 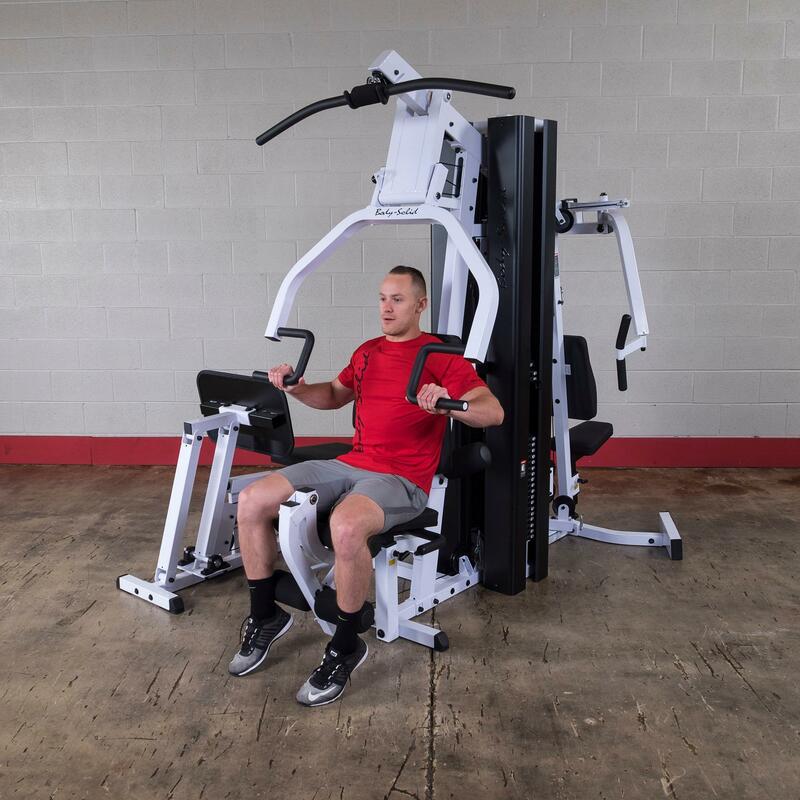 Featuring two independent weight stacks, the EXM3000LPS allows multiple users to workout at the same time. You no longer have to waste time waiting on someone else at the health club. Leg Press, Calf Raises, Donkey Kick Backs. Pec Flys, Rear Delt, Ab Crunches (Mid Pulley above seat). Low Row, Abduction, Adduction, Bent Over Row, Kickbacks, Shrugs, Arm Curls, Upright Rows, . Chest Press, Shoulder Press, Lat Pulldown, Mid Row, Leg Curl, Leg Extension, Standing Shoulder Press, Triceps Extension, etc. 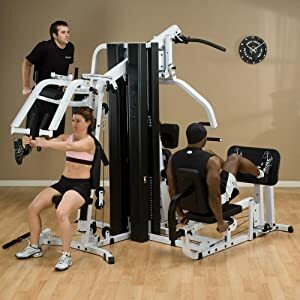 Up to 3 individuals can work out at once. Vertical Knee Raise, Leg Raises, Obliques, etc. 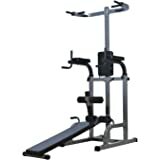 The Body-Solid Multi-Station Selectorized Gym (EXM3000LPS) offers a weight room full of workout options in a minimum amount of space. 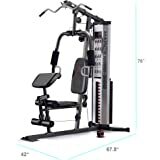 Great for home or professional gyms, this machine features seven unique stations that target every major muscle group, with dual 210-pound weight stacks that feed three stations, so multiple users can work out simultaneously. 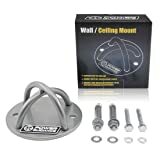 Two full-length, solid steel shrouds entirely encompass each weight stack for enhanced appearance and improved safety. DuraFirm back and seat pads are durably designed to stand up to rigorous use and will never bottom out and are adjustable to fit users of all sizes. 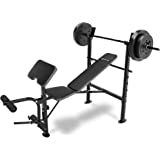 A multi-function press arm station provides bench press, incline press, shoulder press, and chest-supported mid-row exercises, while the fully-adjustable perfect pec station with range limiters allows users to achieve deeper muscle penetration for faster, more defined results. 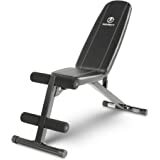 The Leg Press/Calf Press Station operates on a 2:1 weight ratio, giving the home gym the capacity of a 420-pound leg press. Unique two bar linkage self-aligns the angle of the leg press plate to the user's body. 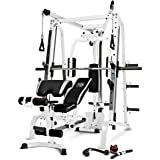 Use the lat pulldown/high pulley station to perform lat pulldowns, triceps pressdowns, and cable crossovers, with pillow block and sealed ball bearings for precision alignment and friction-free movement. The ab crunch/mid pulley station helps develop abs and triceps effectively. The leg developer station's works quads and hamstrings while developing knee strength via precise biomechanical form during the most demanding leg curls and leg extensions. The seated row/low pulley station offers exercises essential for well-developed backs and good posture. 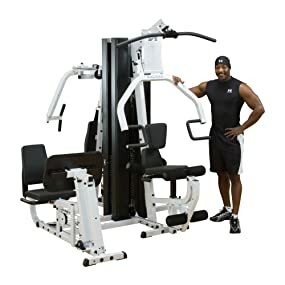 When assembled, the Body-Solid Multi-Station Selectorized Gym measures 91 by 73 by 83 inches (L x W x H) and weighs 947 pounds. 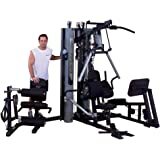 The Body-Solid Bi-Angular Gym is backed by the Body-Solid Lifetime In-Home Warranty and Full Commercial Warranty. 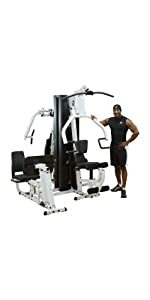 The Body-Solid EXM3000LPS Double Stack Home Gym offers an impressive array of strength training exercises in a compact, space-saving design. This multi-station gym provides health club quality fitness training for up to three people simultaneously. A multi-function Press Arm Station provides bench press, incline press, shoulder press, and chest-supported mid-row exercises, while the fully-adjustable Perfect Pec Station with range limiters allows users to achieve deeper muscle penetration for faster, more defined results. 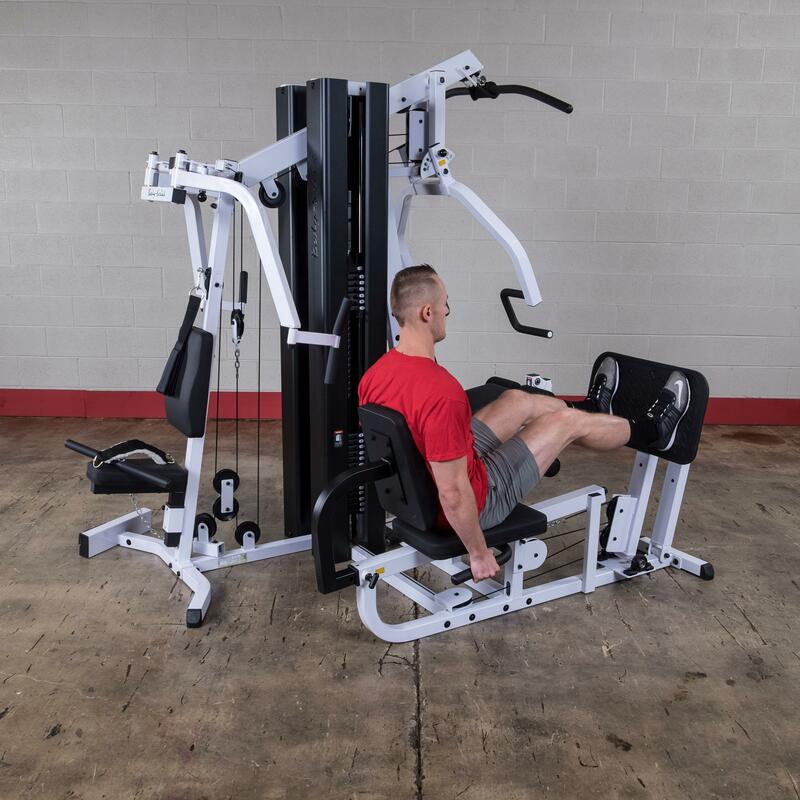 The Leg Press/Calf Press Station operates on a two-to-one weight ratio, giving the EXM3000LPS the capacity of a 420-pound leg press. Thick, durable DuraFirm pads are contoured for lumbar support, and every pad, pop pin, and pivot point feels natural and ergonomic. Both weight stacks are within easy reach for quick, safe weight selection, and a non-slip, rubber-encased foot plate is constructed of heavy-gauge steel for safe operation. 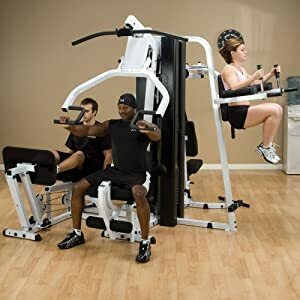 Multi-Press Station: Three stations in one, with fully adjustable pads for every size user and full range of motion exercise. Structurally and biomechanically designed to focus on chest, back, and shoulders. Leg Press/Calf Press Station: Unique two bar linkage self-aligns the angle of the leg press plate to the user' s body, eliminating ankle torsion and ensuring proper biomechanics throughout the full range of motion for all size users. Includes pillow block and sealed ball bearings for precision alignment and friction-free movement. A two-to-one ratio can convert the 210-pound weight stack into 420 pounds of resistance. 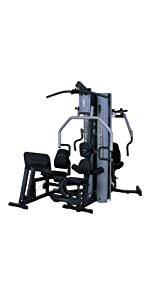 Features adjustable back pad with two-position press plate for complete leg and calf development. 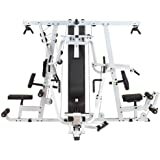 Perfect Pec Station: Dual overhead cams with six increment settings per arm provide variable starting positions and allow fine-tuning for accurate pre-stretch with optimal biomechanical movement. 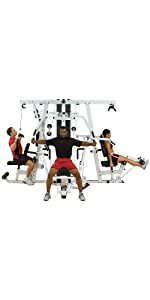 It's a two-function station that ensures maximum development of pectoral and rear deltoid muscles. 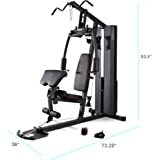 Lat Pulldown/High Pulley Station: Ideal for increasing size, strength, and endurance of your back, shoulders, and triceps muscles. Unique easy-access hold-down rollers fit every size user without adjustment. Ab Crunch/Mid Pulley Station: Create a lean and muscular waist with absolute isolation of your abdominal and oblique muscles. Unique design also allows a high degree of comfort when doing triceps extension movements. Leg Extension/Leg Curl Station: Cam-driven leg developer works quads and hamstrings while developing knee strength via precise biomechanical form. Seated Row/Low Pulley Station: Essential for well-developed backs, seated row exercises build depth in the middle back and train the hard-to-reach lower lats. 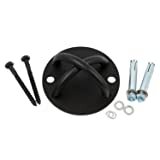 Low pulley swivels smoothly and fully to provide accurate resistance for cable curls, upright rows, shrugs, leg abduction, leg adduction, and more. Dual 210-pound Alloy Steel Weight Stacks: Two weight stacks employ nylon bushings for smooth, quiet operation. DuraFirm Pads: Durable, tear-resistant, fully supported DuraFirm pads are double stitched and sewn. These high density, top grade pads are guaranteed not to wear out. Body-Solid gym equipment includes a limited lifetime manufacturer's warranty against defects in materials and workmanship. Body-Solid, Inc. is a leading manufacturer and distributor of high quality fitness equipment for the home and commercial markets. With over 20 years of experience, Body-Solid offers one of the widest arrays of products in the industry, including multi-station gyms, free weight machines, a complete line of cardiovascular products, weight plates, kettle bells, dumbbells, and fitness accessories. 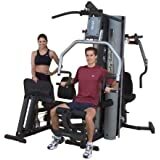 5.0 out of 5 starsGreat Gym - Plan how to assemble first - Send in warranty within 10 days! This Gym is the real deal! Solid and built with no compromises! Some have complained about the instructions, but I think they were sufficient with diagrams that show how it all goes together. A picture is worth a thousand words, and if you tried to explain how to put this size of a project together by worded instructions, you would definitely confuse some people, especially if it were done by someone with ESL language skills. Second, you would need a lot of wording and that in itself would turn a lot of people off. The diagrams are simple and you need to study them carefully while assembling the gym. Here is my experience and advice if you want to put this thing together like a pro. My wife was telling me to hire someone, but I'm glad I didn't. You will have a much better understanding of this gym if you do it yourself. It's not too hard, but it is a big project. So you need to take your time and work carefully and not expect to put it together in an hour or two. Save yourself a couple hundred bucks! I needed to put this thing in a room that is 10.5 feet by 12 feet. Not a very big space for this equipment. 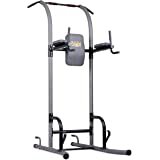 I already had a tread mill, stair climber, and an inversion table in the same room, all of which I wanted to keep. 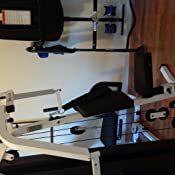 After looking at all the pictures of the EXM3000LPS gym online of all the different stations on this gym, I decided to put my existing equipment in the corners of the room and the gym positioned in the center so that the gym and my other equipment wouldn't interfere with each other. Not being too sure of the outcome, I assembled the gym so that it would be able to re-position the gym if there was going to be any problem. If you face a similar problem of not knowing how exactly you want this gym to be positioned, then you need to follow the order outlined below so you can move the gym before it becomes too heavy. First, unpack all the boxes that come. Get the instructions (diagrams & parts list) and look them over good. 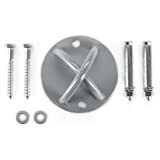 Each part has an identifying letter and number on the parts list, and the corresponding part letter and number labeled on the assembly diagrams. But the parts themselves are not labeled except for colored stickers on some parts that show which section of the frame they are on. Also note that the instructions mention that you have 10 days from the purchase date to register your purchase for warranty service. If you are not ready to put this thing together right away, I suggest you open the boxes to get the registration paperwork and get that done. Not sure whether they would give you any trouble if you were late, but that's what the instructions say. So get a roll of masking tape and a fine marker, and unpack all the parts, bolts, washers, frame parts, and identify them and place them in like groups and check the numbers. Measure the diameter and length of bolts and stick the masking tape and identifying letter and number on each group of same parts. One issue I had was there were two parts that I didn't find, which hold in some round foam pads. I thought they were missing, however, during assembly I found that these two parts were replaced by a single part which goes into the end of a 1" pipes and holds the foam in place. But here is a note of caution: There are actually two parts shown on the parts diagram which have the same exact description, "01" ROUND ENDCAP" but the part numbers are not on the parts. 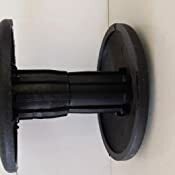 The only way to tell the difference, which is that one has a slightly larger diameter than the other, is to stack them together so that the larger diameter part is noticeable. I made the mistake of forcing the larger part into the smaller hole and then was left with a part that wouldn't stay in because it was in the wrong location. And the first part was forced in to where I would have to destroy it to take it out. The smaller part goes on 1" pipe on the frame and there are two, the larger parts go for the knee bends and there are 4 of them. The pipe welded to the frame have a smaller hole than the knee bend pipes. The foam pads are all the same that are held in by these parts. After you have identified all the parts and have them neatly laid out around the room where you are assembling this gym, then work on getting the frame together first. DO NOT assemble the weight stacks or any cables and pulleys, leave them for last. Put together all the main frame parts and if you need to adjust the position a bit this way or that, you will be able to push and adjust the gym. But once the weight stacks are in, you cannot move this gym. On the top of the gym where the weight stack poles attach, you can put the bolts in to hold the system together, but do not tighten them until you have assembled the rest of the frame and then put the weight stacks in and tighten everything up.The last thing to do is to assemble the cabling and pulleys. Trust me, you will have to remove cables and pulleys if you try to install them too soon. Take a little time to properly identify the cables. Just like the rest of the parts, the parts themselves are not labeled. But you can determine which ones are which based on the ends, lengths and other details of each cable. And once you have everything else assembled, you can understand which cable is used where better, and they are shown on the diagrams. All the pulleys are the same, except one. Don't make the mistake of assembling everything on each diagram in the diagram page order before proceeding to the next. 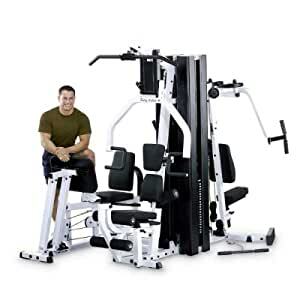 Instead, assemble the frame first, then the seats and all other parts, then the weight stacks, weight stack covers, and last the pulleys and cables together. I also had an issue with one of the pulleys rubbing on a weight stack cover. I could not adjust anything to give it more clearance so I adjusted the hole in the cover to move the it 1/4" away from the pulley and it is fine. Not a big deal nor any compromise in functionality at all. But I want it to be quiet and something rubbing would bug me. You could put this thing together in a day if you begin early and work hard at it. But I assembled it over several days and took my time and enjoyed seeing it come together. It is such a good quality product, I didn't mind assembling it at all. And when it's all done, you know all about your gym. As far as the end cap that I forced in the wrong place, I contacted Body Solid and they sent me 4 replacement parts. The customer support is excellent from Body Solid. One other issue was that the weights on the weight stacks were sticking on the vertical bars that hold the weights in place and guide them up and down. This was solved by applying a little silicon lubricant, like the kind you use on a treadmill, to the polls. That made everything work smoothly. Don't use grease or oil since there is plastic bushings inside the weights. I attached some photos of how my gym fits with my other equipment, and also a comparison photo of the two end caps that look alike and how to tell them apart. The room is 10.5 feet by 12 foot but my wife and I can use all my equipment without any problems. 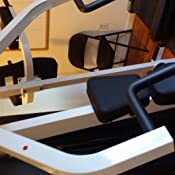 The inversion table folds up against the wall, the treadmill is near the ab station, and the stair climber is in front of the leg press. We even have room for a chair to change shoes on. 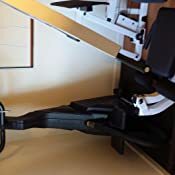 This system is fantastic for the home gym. 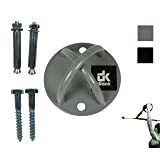 High quality, operates very smoothly, and covers everything top to bottom especially when you add on the Vertical Knee Raise. We installed it in our basement on (4) horse stall mats which left the perfect footprint for this to be on.......8 feet by 12 feet. We just started using it and am amazed with the amount of exercises this provides. Will never need a gym membership again. Love the convenience! Take the time to unpack EVERYTHING and lay it out per station.....sort it.......sticky tag it with the part piece. Sort all the hardware into bags and mark on the bag the part piece. Note each station has a red, blue, or yellow dot and tend in general to be packed station by station. Note the dots tend to be on the "up" side of the piece. Print out the directions from Body Solid website on 11 x 17. Easier to see than the provided 8 1/2 x 11. Note the page numbers on the directions. Install in this order. Print out all the photos in different orientations you can find. Will be very helpful. For the cables, run everything then tighten the nuts/bolts. If you start by tightening the nuts/bolts for the pulleys, you will have to undo some of them to get the cables in. 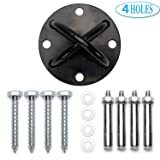 Don't forgot to check to make sure there are not plastic end caps or levelers needed under a piece. We did that, then had to find a way to life it to get them under there. Not fun. And......bring patience! We took our time and worked on it in the evenings for a few hours till it was done. 100% worth it and I find it helps me understand the machine better and the possibilities for workouts. 2. 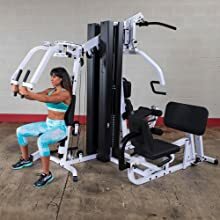 Haven't found any other product that can even come closer in terms of providing so many exercise options for such reasonable price and build quality. 3. Customer service is the main reason why I gave 5 stars and am leaving a review for everyone to benefit. I faced a few issues while assembling this and customer support (Rich K. & Rodney) from body solid was excellent. They sent replacement parts for free not once but twice. 4. Not very high and so can be installed in the basement for most of the homes. Time and instructions required to assemble - I wish body solid can post a video on their website describing the assembling process. It will resolve the only negative with this gym system. 5.0 out of 5 starsHigh quality. High quality. 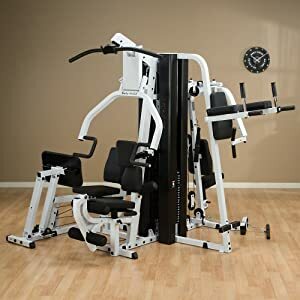 Feels and looks like something you would use in an actual gym. When putting together must be very organized to make it easier. Some minor parts are replaced with different parts and I had some extra plastic caps and washers left over. Works great. Have been using for past 5 months. I would buy it again. 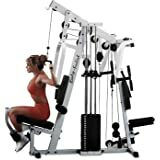 5.0 out of 5 starsThis is a fantastic quality gym backerd by great customer service personnel. The quality of this gym is top notch. 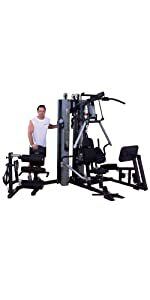 We've had a few different home gyms over several decades and this one is far and away the best quality. I was also impressed by the tech support staff at Body Solid. A real person, who speaks english answered the phone and e-mailed me a copy of the assembly manual. Just beware that assembly of this complex piece of equipment will take some time. I have approx 9 hours of labor in putting it together, and I am no novice using tools and figuring mechanical things out.